A little information on this whitework sampler: it isn’t a “planned” sampler. I have some ideas in my head concerning where I want to go with it, but there’s no grid or design I’m going by. My point is to work out various whitework techniques and photograph them along the way. Different types of whitework techniques may seem rather daunting, but I want to wipe away that idea and hopefully pique people’s interest in trying out new embroidery techniques. For the sampler, I’m using a 32-count Belfast linen in a natural color, cut 18″ x 20″, and mounted on an Evertite stretcher bar frame. 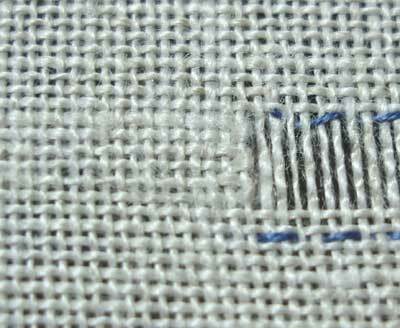 Concerning the count of the linen, for newbies to certain techniques, it might be best to start with a lower count, such as 28 or even lower. 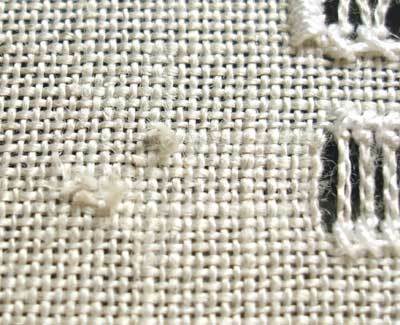 For most of these techniques, Aida fabric (commonly used for counted cross stitch) is not really a choice. 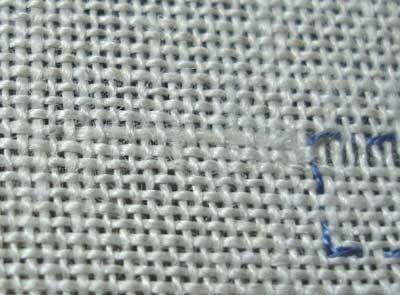 Linen is the fabric of choice for most whitework, though there are some decent linen blends or cotton that can also be used. For threads, I have a line-up of quite a variety of white threads in various types and sizes: coton a broder, perle cotton, cordonnet, cebelia, floche, some silk (soie 100/3, soie perlee, soie gobelin, soie d’alger), Mountmellick threads, and regular stranded white DMC cotton… and I’ve probably forgotten some. Seems like a mish-mashy sort of mix, and it is! You don’t need this variety to undertake any of these techniques! Some perle cotton #8 and #12, along with white floss, will serve fine for starters. For tools, I’ve got my tiny Dovo scissors (they’re 3.5 inches, by the way, for those of you who asked), tweezers, a tiny crochet hook (#12 – I find this handy when withdrawing threads), a needle threader, and several sizes of tapestry needles. The first step in this sampler is to work with some drawn thread techniques, so I began by withdrawing some threads and re-weaving the withdrawn threads back into the fabric so that I would have a clean edge. This process is a bit more complicated than other ways of finishing the edge of drawn thread work, but I figured I’d at least do it once to show you. To make the whole drawn thread process easier, think ahead. To keep it simple, I started with an even number of vertical threads to work over, since I’ll be bunching my threads either in groups of two or four. So I wanted my first drawn thread strip to be over an even number of vertical threads divisible by 4. I picked 80. I basted in blue around a strip on my fabric that was 80 threads wide and 8 threads high – or 2.5 inches long and a quarter inch high. 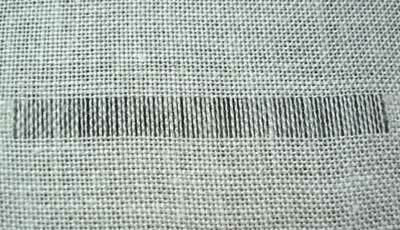 Basting should never be underestimated in drawn thread work – it can save you from accidentally cutting threads that will take you ten forevers to repair. So do baste! You can see where I basted off my strip for withdrawing the threads. First, snip the top two horizontal threads inside your drawn thread area, at about the half-way point in the strip. I’m going to re-weave the second thread into the holes left by the first beyond the edge of the basting, so it’s easiest to work with a pair of threads at a time, rather than to cut all the horizontal threads at once. Second, withdraw your first thread to about an inch past your basting line. Third, withdraw the second thread up to the basting line. To withdraw the threads, you snip the horizontal threads at the halfway point in the strip or area you’re withdrawing from. Then, using a tapestry needle (they have a blunt tip), run it under the thread you’re withdrawing and pull the thread out of the weave. Try to be careful with the threads – you don’t want to fray them up too much – but keep in mind that they will soften as you take them out of the weave. Take your tapestry needle and weave it in and out of the spaces where the first thread was withdrawn. Make sure you are following the same path the first thread took, alternating up and down over the threads. 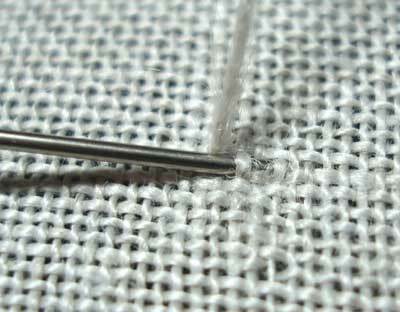 Once you have the tapestry needle worked into the fabric correctly, use a needle threader to pull the second withdrawn thread into the eye of the tapestry needle. 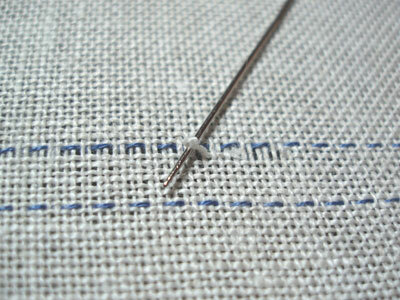 Now pull the tapestry needle through, so that the second thread fills up the empty path of the first withdrawn thread. Thread the first withdrawn thread into your tapestry needle, then take it to the back so that the weave matches. Continue working with the threads, two at a time, in this manner until all the drawn threads are rewoven and sunk to the back. Then… move over to the other side of your drawn thread area, and do the same thing there! Well, I do secure my threads, in a way, before trimming them on the back. This is what I do. To demonstrate here, I picked the first thread back out again (kind of messy!). You can see the first thread in the photo above (I have a magnet holding it back for photo purposes) and you can see where the second thread (already rewoven) ends. There’s a little gap there, with a vertical thread still in place. The first drawn thread needs to pass over that vertical thread, then back down into the fabric, for it to look finished. Take your tapestry needle, and, working from left to right (from the first thread towards the second re-woven thread) weave the needle over the one vertical thread that’s showing, under the next vertical thread, and then over the next thread (now you’re working into the end of the second withdrawn thread) and to the back of the fabric. 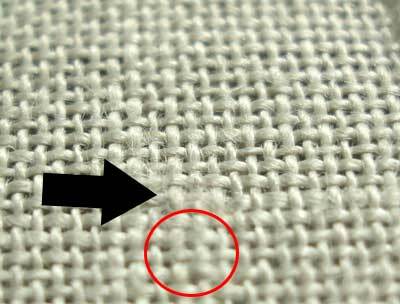 You will have one intersection of fabric threads that has two horizontal threads in it, but it won’t be noticeable. This isn’t the best photo in the world, I suppose, but the arrow points to the finished area for this thread. It’s very fuzzy because I over-worked the first withdrawn thread in order to get the photos! But notice in the red circled area below the arrow. This is where the other threads were rewoven, and it looks fine. The photo above is of the back of the work. Turn your work over, and you will find a long, hairy mass of thread on the back of your fabric where all the threads have been sunk. Trim them. …. And that’s how you secure and finish the threads on the back. There’s the strip with only the vertical threads remaining. It doesn’t look too impressive, does it? But if you patiently worked that far, you did a good job! The sides are a bit fuzzy from working with the withdrawn threads, but that cleans up significantly once the stitching is started. Withdrawing and re-weaving threads in this manner to get ready for the fun part (decorative stitching and bunching of the remaining threads) is, admittedly, somewhat tedious. 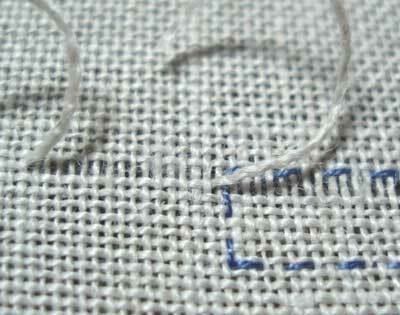 But it is the only way to provide a finished fabric edge on your drawn thread work. I’ll show you other ways of securing the edges later, but they involve a patch of stitching on the edge, whereas this technique gives you a clean edge that matches the rest of the fabric. So, after the first venture in drawing out threads and getting into this project, I’ve noticed a couple things: 1. Natural colored linen – it’s a bit darker than a golden wheaty color – doesn’t photograph well, either. I should have picked something darker, like the oatmeal color of my monogrammed towels; 2. an 18 x 20 piece of linen might be a bit too adventurous, if I’m really planning on filling the whole thing up….! Actually, I’m having fun so far – I’ve managed to stitch a few areas of drawn thread work, which I’ll share with you (along with how-to’s) in upcoming days! Thank you for this! I have recently made my first attempt at withdrawn thread work (following instructions from an old book on needleweaving)and your instructions on weaving in the ends are very helpful. 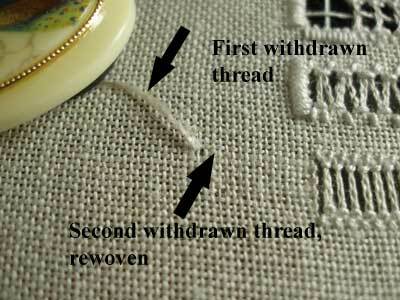 Can I ask though – when the first thread goes through to the back is it just taken down or woven under the second thread? Thanks for this post, Mary! I love this kind of work – i name it pulled threads!!! One thing I couldn’t understand : what happens to the first thread after being taken to the back you don’t have any more an empty path. This type of work (all whitework embroidery I like so much, thank you very much for sharing Mary. The explanations of your work are clear, I will follow you! I tried to do..so..I understood that I have much to learn, LOL! Thanks all, for the comments! Ah – good point on the last thread – I’ll write something up on that and take some photos…. 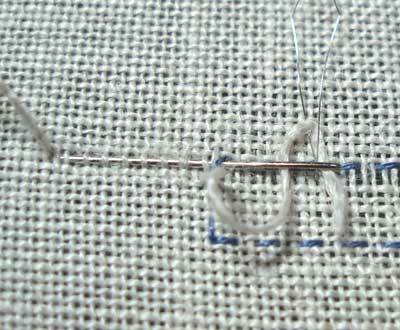 When I do this technique, I pull the first thread completely out to beyond my stitching area, then reweave the second thread completely in it`s place. This only works if the band to be worked is the width of the sampler. The thread I am reweaving also gets very fuzzy sometimes. 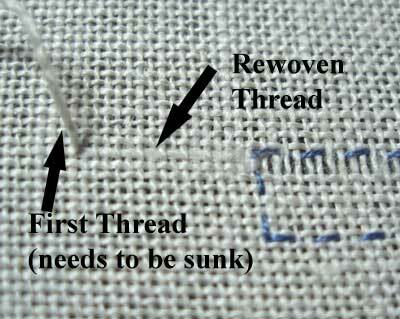 In your method, what do you do with the first thread after you sink it? I picked out one of the threads today and took pictures of how I end it. I’ll edit this tomorrow and add the photos. Once the threads are sunk and secure, though, I just trim the backs. Thank-you Mary! Yes, you really do have readers…your blog is amazing! That is brilliant, very clear and helpful. Thanks again for taking the time to help your grateful readers. Thank you very very much, Mary! Mary, thanks very much for this tutorial. That gives such a nice polished look for the fabric edge. I’d always wished mine looked better. thank you Mary, for your explanation for what I see, how to hold it as similar to bamboo sugeta when repairing a wicker basket, that is, which is the thread that holds 2 to 1, now has not tried to ask horizontal a pinhead? Thank you for such a clear description of this work. This will be a first for me and I’m looking forward to starting. I have an antique piece of drawn thread embroidery It is beautiful but sections of it are broken. Any way to replace these areas? The thread count is really high and looks like I could drive myself crazy trying to add threads back but it is all I can think of to do. I have never done this type of work but am familiar with the technique. Ah, Sara! That sounds like a toughy. I take it you’re talking about the threads that remain in the actual drawn thread part of the design? The only thing I could suggest would be to re-weave some of the same sized threads back into the piece from behind, then bring them up into the drawn thread area into the parts of the design where they are missing. With a high thread count fabric, this could be really difficult, but with patience, it could be done. You could anchor the new threads into the stitching on the back of the piece, right around where they are needed, place them in the design where the broken threads are, then anchor them again in the back of the stitching. That would probably work, too. The trick is finding the same sized thread. Is there a hem on the piece? I guess you could take out the hem on one side and remove some threads to use for the replacement, and then hem the piece up again. That would give you the same exact threads to use. I wish you luck!! Let me know how you get on! My gosh! Wow! You are so talented, not only at your needlework, but with your explanations as well. Tonight I was glancing through my Better Homes and Gardens Guide to NEedlework and I saw some drawn threadwork there. I thought to myself, that it was really amazing looking but probably way too complicated for me to try without taking me fifty million years to try to understand and figure everything out. After looking at just this lesson, so far, I already feel like I understand and will keep reading your lessons. I will definitely give this a try, maybe even on my nameplate that I am currently working on! After testing on another piece of fabric first. I think it would really add extra interest to the piece and even go with the flow of the look that I am trying to achieve!!! Thank you again so much for your dedication to bringing great techniques to all of us. It is definitely appreciated!!! Am totally interested in learning how to do drawn work so found your site quite helpful. My question comes re re-weaving thread #1. 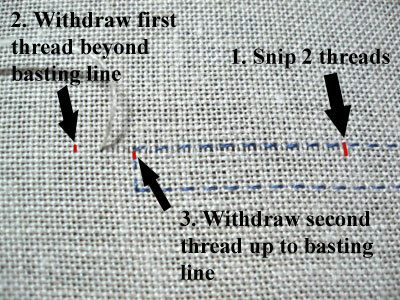 After re-weaving thread #2 in thread #1’s place, you take thread #1 to the back and weave it toward the basted outline? It would be woven in the same pattern as thread #2. With no knot or vertical thread to wrap around, what would stop thread #1 from coming out? Thank you! I’ve been searching for about 4 hours regarding this type of needle work and finally (what took me so long) found your page… very clear, very thorough. You are bookmarked and followed! I have just discovered drawn thread work and have been having some fun with a sampler. My problem with this technique for drawing the threads is that you don’t have anywhere to secure your stitching threads. For example, if you do coral knots, you start in the centre of the drawn section. I’ve been using a waste knot to start with. Originally I intended to take that down and run it througb the back of the hem stitches, but I’ve found that the thread is visible from the front, so it looks messy. Are there any rules about that do you know? I’ve been wondering if it would be okay to just do some back stitches along the edge. The perle thread is almost the same colour as the fabric, so it would be hardly noticeable. I can see why people do the satin or blanket stitch edging, as it does solve that problem! But it woukd be nice to know if there was a ‘right’ way to do it. I have been working on some drawn thread work started some time ago in a class. Had no idea (nor instructions) on how to do do an ‘internal selvedge’ to secure threads that had been drawn out and were ‘waving in the breeze’ . Searched and searched for an answer…then finally, and of course, I found this explanation you posted in 2009. Should have searched your website first! Now I can go ahead and tidy up my wee project by following your detailed instructions. So my very grateful thanks are winging their way to you. Take care of yourself. Regards. Hi. Has anyone used this method for weaving in ends on a garment? I’ve been hemstitching on shirts and aprons, but I’d like to do something bigger. Will this weaving in stand up to laundering?